Apollo 13 - 4K UHD Review - ReDVDit! Apollo 13 is a 1995 American space adventure docudrama film that was directed by Ron Howard and features stars like Tom Hanks, Kevin Bacon, Bill Paxton, Gary Sinise and Ed Harris. The screenplay was written by William Broyles, Jr. and Al Reinhart, and it dramatizes the aborted 1970 Apollo 13 lunar mission, and is an adaptation of the book Lost Moon: The Perilous Voyage of Apollo 13 by astronaut Jim Lovell and Jeffrey Kluger. The film depicts astronauts Lovell, Jack Swigert, and Fred Haise aboard Apollo 13 for America’s third moon landing mission. En route, an on-board explosion deprives their spacecraft of most of its oxygen supply and electric power, forcing NASA’s flight controllers to abort the Moon landing, and turning the mission into a struggle to get the three men home safely. Howard went to great lengths to create a technically accurate film, employing NASA’s technical assistance in astronaut and flight controller training for his cast, and obtaining permission to film scenes aboard a reduced gravity aircraft for a realistic depiction of the “weightlessness” experienced by the astronauts in space. Originally released to cinemas in the United States on June 30, 1995, Apollo 13 was nominated for nine Academy Awards, including Best Picture (winning for Best Film Editing and Best Sound). In total, the film ended up grossing over $355 million worldwide during its theatrical releases and was very positively received by film critics. 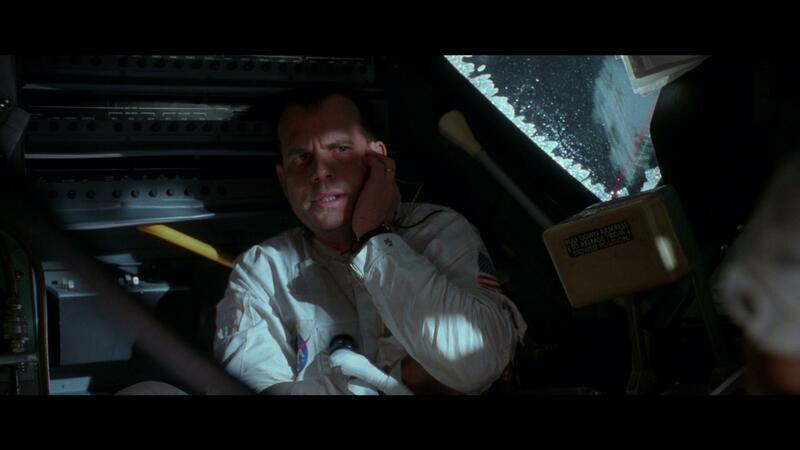 Apollo 13 is one of those films that a lot of us have grown up with, doing everything possible to convey the stressful and danger of everything that happened during this specific space mission. With Ron Howard at helm, he knew the importance of conveying that message and you can truly see his attention to detail as the movie plays onward. With its star-studded cast, this film does an absolutely fantastic job at portraying that message, providing audiences with an awesome story that is held up very well throughout. Apollo 13 was shot on 4-perf 35mm film stock with spherical lenses in the Super 35 configuration, and cropped to the 2.35:1 aspect ratio for theatrical projection on anamorphic 35mm film prints. For this UHD release, the film has been prepared from the same 4K scan of the film created for the 2015 20th Anniversary Edition Blu-ray, but is presented here in full 2160p resolution and features an HDR10 enhanced encode. It retains the original 2.35:1 aspect ratio of the original theatrical presentation. 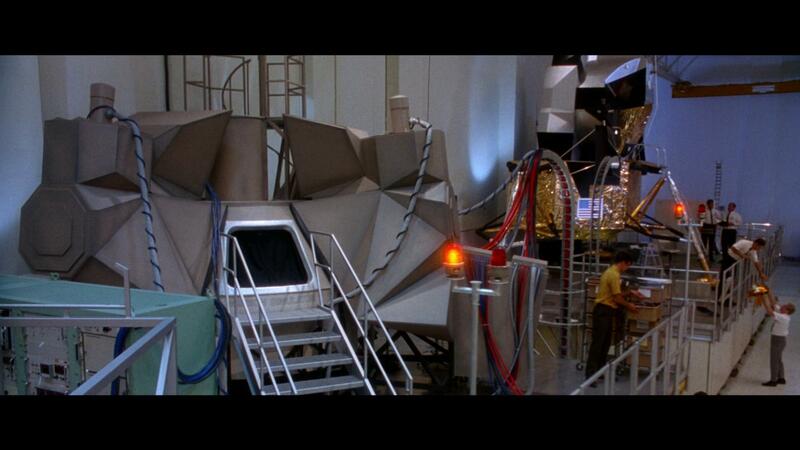 Apollo 13 looks about as incredible as one would expect for a movie shot in the Super 35 format and finished photochemically in the mid 90s. Under the incredible scrutiny of the 4K resolution lens, it both stuns in one shot, and looks fairly average in the next, based on shot composition. The 2160p resolution image presentation soaks in all of the rich detail of the film’s many close ups and midshots, but also reveals all of the wrinkles and deficiencies that the Super 35 film format brings to the table. Wide shots that could hide under the limited resolution of 1080p now look glaringly low def. 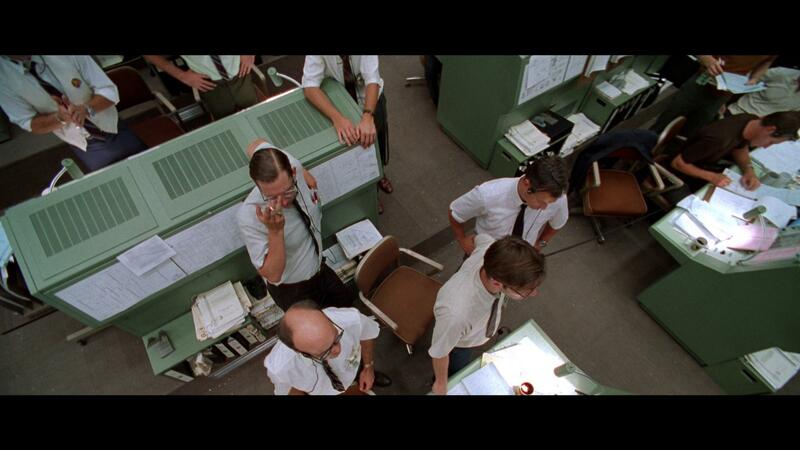 Compare some of the wider shots of the Houston mission control center to some of the close-ups that take place in the Aquarius and you’d swear they came from different generations of film negatives. At the same time, the film’s wonderful blend of practical and digital effects holds up far better under the same scrutiny, showing only a little bit of the 22 years of age it must shoulder. Where the film sees majority of its improvements is in grain structure and color timing. The film’s grain structure has never been more consistently sharp and even than it is here in 4K, and for the first time ever, the utter blackness of space is truly black. It accentuates the hopelessness our astronauts feel as they gaze out at the wreckage of the Odyssey, and how truly alone they are up in space when they look back at the Earth below them. The HDR10 polish doesn’t make this film any more vibrant, but pushes its colors deeper and richer than they ever have been before. It captures the warmth of the early 70s interior shots, and the utter coldness of space in a way that makes it easy to overlook the sharpness and inherent resolution issues with the film’s Super 35 format negative origination. 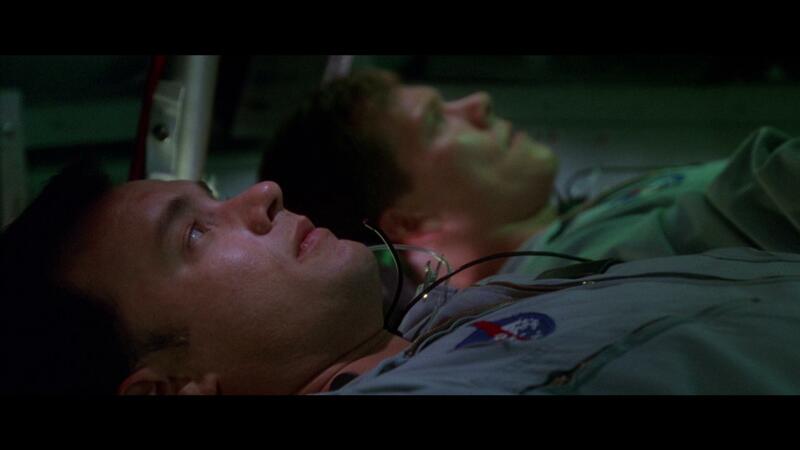 Apollo 13 was original presented in theaters with a 5.1 DTS Digital Surround Sound mix on 35mm prints. That original mix is presented here, re-engineered in the DTS: X positional sound format. For review purposes, the film was listened to with a home theater in the 5.1.2 speaker configuration. After listening to Apollo 13 in DTS: X, I felt physically assaulted. Now, mind you, it wasn’t a consistent feeling of assault, but there are a few key scenes that just feel so much larger, and so much more aggressive with the addition of height channels that I literally found myself bracing for impact during the feature. If anything, these 2 or 3 incredible scenes made me really appreciate how effective the contrast between these loud and soft scenes were in a brand new way. When the Saturn V rocket takes off in the film, you really feel engulfed by the wall of sound that is produced, but when Lovell and the crew and floating quietly through the innards of their spacecraft, it feels so quiet and small. Surround use is effective and forceful when appropriate, and sub woofer activity is ferocious when necessary. 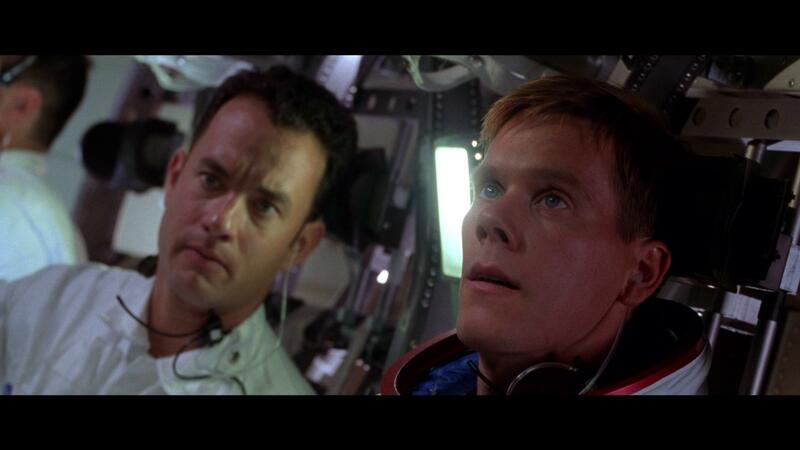 I’ve listened to Apollo 13 in just about every format imaginable – digital stereo, DTS and AC-3 on Laserdisc, and even DTS-HD Master Audio on previous Blu-ray releases, and they all sound great in their own way, but man, this DTS: X soundtrack feels like a much more creative application of the sound than what was capable previously with a six channel mix. 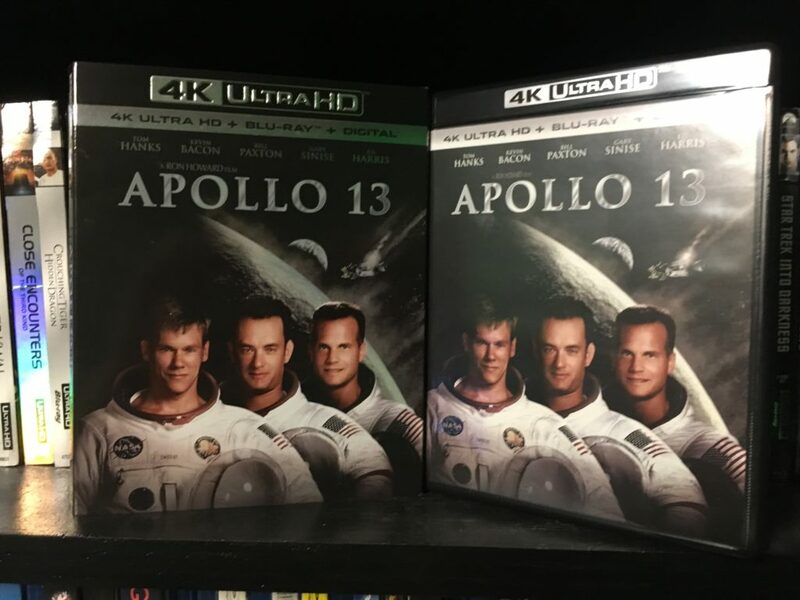 Apollo 13 has been released to UHD Blu-ray in a standard black keep case with matching matte finished slipcover. 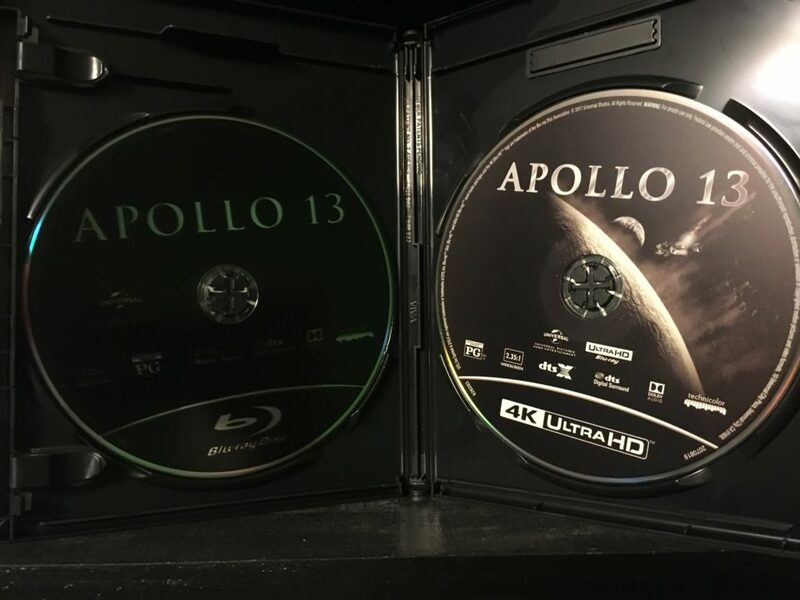 The front artwork, which is the same for both the case and the slipcover, features a shot of the three lead actors that played the Apollo 13 flight crew layered against an image of the damaged Odyssey craft slingshotting around the Moon back to an Earth that’s far off in the distance. 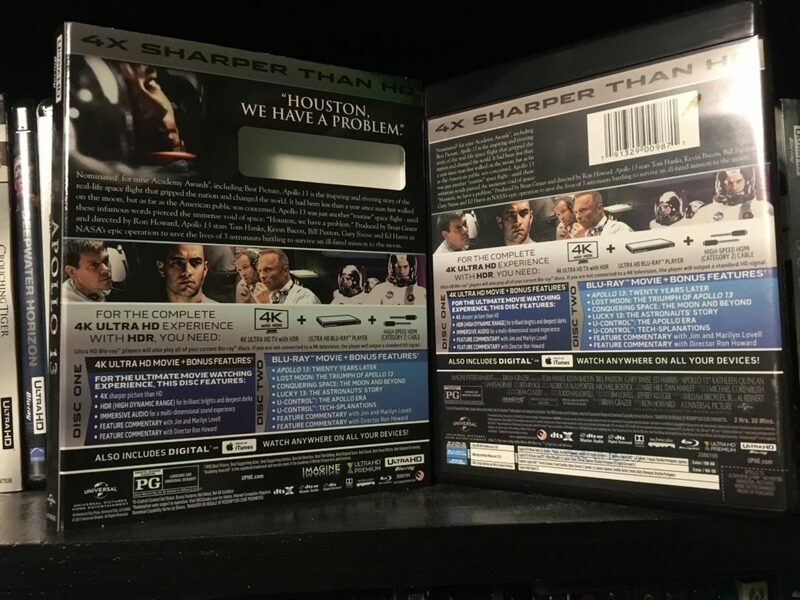 The back artwork is nearly identical on both the case and slip, feature a paragraph about the film, a panel of character shots from the film, and the 4K Ultra HD banner, with info and extras. 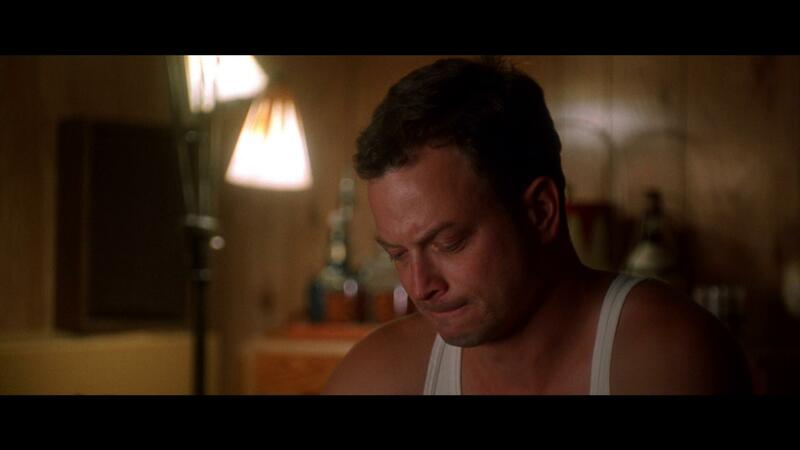 The slipcover gets the classic shot of Hanks as Lovell looking out of his helmet, while the case gets the film’s theatrical credits below the Digital HD banner. It’s a new style of packaging, but one that feels cheesy, especially when they could’ve sourced the film’s intense, far more engaging theatrical poster artwork to a much great effect. Audio Commentary- the 4K disc’s only feature is the film’s dual inventory of audio commentaries, one feature Ron Howard, and the other provided by Jim and Marilyn Lovell. Between the two, you get a good feel for how the picture was made, and how close it hits to home in terms of recreating the mission itself. 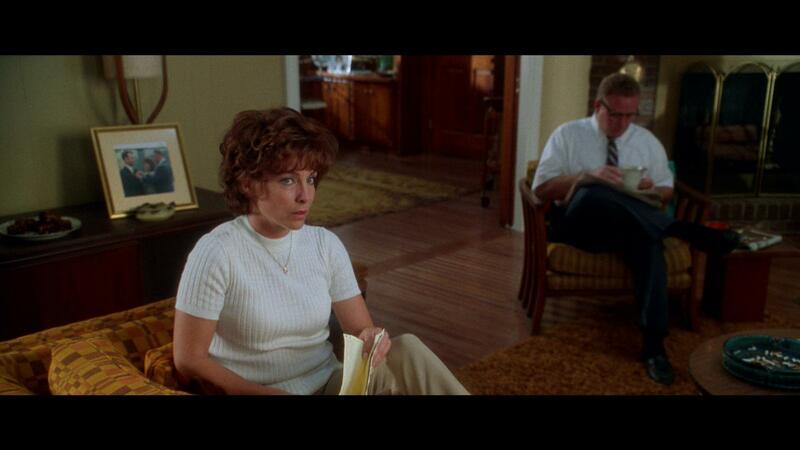 Audio Commentary – Same as above. Apollo 13: Twenty Years Later – a 12 minute feature in which the film’s director, Ron Howard, and producer Brian Grazer discuss what went into making the film, casting Tom Hanks, framing the narrative, and many other topics related to the legacy of the film. Lost Moon: The Triumph of Apollo 13 – a 58 minute long documentary about the Apollo 13 mission filled to the brim with cast interviews, crew interviews, and even interviews with the mission members and ground control team members themselves. It dates all the way back to the film’s Signature Collection Laserdisc release of the film. Conquering Space: The Moon and Beyond – a 48 minute documentary that covers the space race, and the missions to land on the moon and ultimately travel beyond the moon. Originally included on the 2 disc DVD release of the film in 2005. Lucky 13: The Astronauts’ Story – a 12 minute feature from Dateline NBC that is essentially a retrospective on the Apollo 13 mission. It features various interviews with family members and the crew themselves. Theatrical Trailer – the film’s theatrical trailer, as seen in theaters during the time period leading up to the release of the film to theaters in 1995. Presented in standard definition. U Control – a feature that allows you to pull up interactive explanations and trivia facts about the movie while its running. Ultimately, everything except the film’s new 4K transfer and DTS:X audio track are carried over verbatim from the film’s 20th Anniversary release. There are no new features, and a decidedly less than impressive packaging job. I guess that’s to be expected, two years out from the last major release. Still disappointing. The 4K UHD release of Apollo 13 really does a great job at offering an all out immersive experience for its audiences, offering an all new feature presentation as well as some behind the scenes footage that also include more information on the actual events that occurred. For the price that it’s going for, I would hands down recommend picking this release up as it’s definitely worth the $20 price tag.